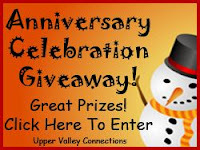 Upper Valley Connections: Let's Celebrate! To enter to win all you need to do is sign up through our website (the contest button, as shown above is on the left hand side of the home/event page), please only one entry per person. Entry into the contest automatically signs you up for our e-newsletter where you can take advantage of special events, activities to do with the kids, kid friendly recipes and money saving coupons to area businesses. Double up your chances of winning by becoming a fan on our Facebook page! Entry for this contest can be done through the UVAA website (the contest button, just like the one above is on the left hand side of the home page) and again, you can double your chances of winning by becoming a fan of their Facebook page. Entry into the contest automatically signs you up for UVAA's e-newsletter as well where you can take advantage of special events, arts information, area coupons and more. Winners for each prize will be drawn randomly during December 6th-10th. Winners will be posted on our Facebook page as well as our blog to wrap up the contest. Complete contest rules are posted on the entry form. Celebrate with us! We hope you'll be a lucky winner of these awesome prizes graciously donated by area businesses. We look forward to many more years of serving families, children and the arts community. Good Luck!